The company has teamed up with legendary industrial designer Yves Béhar – the creative lead for Jawbone and a host of global tech names – to take on Google and Nest with an all-new thermostat and big feature overhaul. The new wall-mounted thermostat is clad in high-end materials, and features an LED display to enable users to switch between heating modes and temperature levels using the dial. It comes in a light grey as standard, but there will also be 12 Dulux matched coloured frames available for £19.99 a pop. However, it's not just a redesign for the tech. A raft of new features have also been added based on feedback from its 200,000 UK users. Hive users – old and new – can now control their heating across multiple zones in your home, enabling you to independently heat upstairs and downstairs. There's also new provisions for up to six different breaks in your daily heating schedule, and the ability to boost heating from anywhere between 30 minutes and six hours. 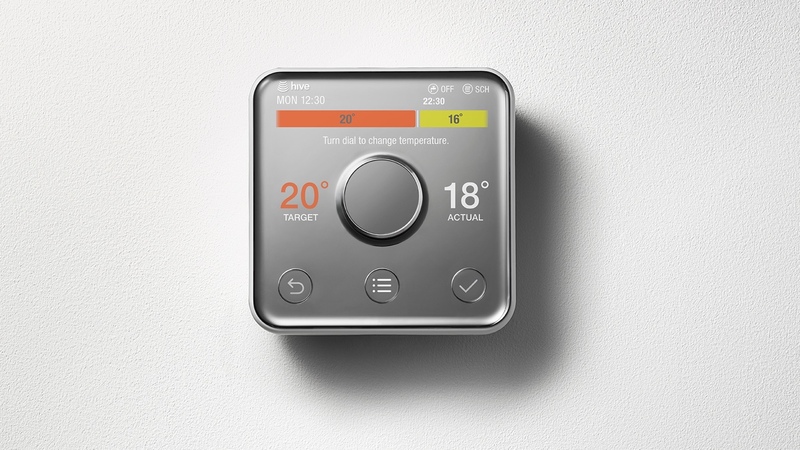 While this is a major update to the hugely popular Hive heating system, the company is also making an aggressive play at the smart home – and is planning to introduce a slew of new connected devices this Autumn. It's adding Hive Active Smart Plugs, Hive Motion Sensors, Hive Active Lights smart bulbs and a security camera to its ecosystem – which will all be controlled within the existing app. It's using its own platform called Honeycomb, which will include pre-made IFTTT-style recipes. While British Gas' Hive system was initially seen as an unlikely competitor to Nest when it launched in 2013, it's amassed a significant customer base in the UK. And with Yves Béhar on board, it means business, and British Gas is looking to expand on both sides of the Atlantic, through its parent company Centrica. "A bewildering array of products means that increasingly IoT and the connected home is confusing customers," said Kassir Hussain, director of connected homes at British Gas. "The smart home until now has been for two types of people: geeks and the wealthy. We want to make these products accessible to everyone and into as many homes as possible," Hussain continued. "We don't want to take our customers into a Jetsons lifestyle." Hive Active Heating 2 is available to order today for an installation in the Autumn at £249. Existing customers can add the shiny new Yves Béhar thermostat for £99.